You might have observed that as you keep installing new apps on your pc the pc startup time increases after a certain period of time. The reason? It’s obvious that it’s due to apps. When you have tons of programs that run automatically during the Windows startup the startup speed increases. The only way to speed up your system is by stopping such programs from starting. You can disable any startup item by going to Start > Run> msconfig and running the startup manager. But, the problem is sometimes we aren’t able to identify unnecessary startup programs. StartUpLite comes to our rescue in such a situation. It’s an application that displays a list of unnecessary startup entries and allows you to disable them from starting when your system boots. 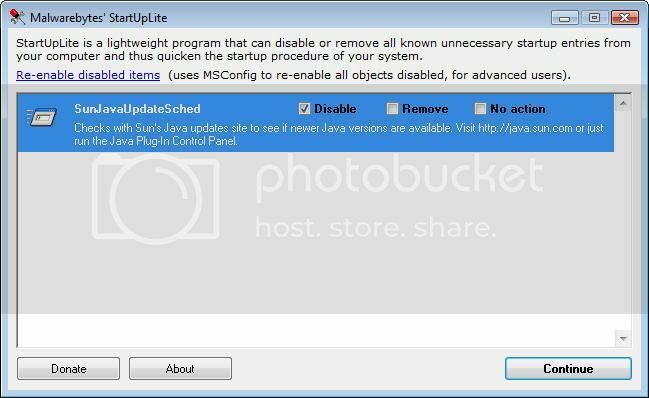 StartUpLite requires no installation, all you need to do is simply double click on the StartUpLite executable file and a window will appear showing you a list of unnecessary startup items. You are given three options to execute, whether you want disable or remove the startup items or just leave it. Click the “Continue” button to apply the settings. If you’re using XP then you can also try out a small trick which will speed up XP boot time.